Is There a Place for Wine on a Low-Carb Diet? If you’re accustomed to enjoying a glass of wine with dinner, relax – you don’t have to give it up while you’re following a low-carb diet. You will need to choose your wine carefully, though, and stick to suggested serving sizes. Also, in some low-carb diets, you may not be able to indulge until later in the program, after you’ve lost a good bit of initial weight. Low-carb diets all work the same basic way – they restrict the grams of carbohydrate you consume in a day, while increasing protein and fat. These two macronutrients are more filling than most carbs, so you feel satiated without overeating. If you’re embarking on a do-it-yourself low-carb diet, you may decide to dip as low as 20 to 50 grams of carbs a day, which is considered a very-low-carb diet. Or you may pick any number up to 130 grams of carbohydrate a day, the amount the U.S. government has set as the adequate intake of carbs. On her website, registered dietitian Nicole Barnick advises DIY dieters to limit starchy vegetables, grains, milk and fruit. If you follow an established low-carb diet, the plan may delineate phases in which you consume progressively larger amounts of carbs until you reach your target weight. In diets like Atkins and South Beach, you graduate to different kinds of carbohydrate, too, beginning with nonstarchy vegetables and eventually eating grains, dairy, legumes, fruit and starchy veggies. The classic Atkins diet starts off at just 20 grams of daily “net carbs” – the number you get when you subtract grams of fiber and sugar alcohol from total carbs. It then progresses through four phases until you’re eating 100 grams a day from all types of carbs. On a DIY low-carb diet – even if you go as low as 20 grams a day – you can imbibe whenever you want, says Dr. Andreas Eenfeldt on DietDoctor.com. But you must make sure you figure the carbs in your glass of wine into your daily total. Dry wines have fewer carbs than sweet wines, so consider that when making your wine selection. 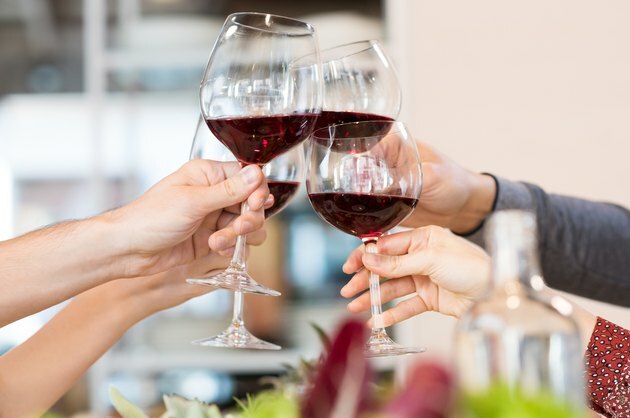 A 4-ounce serving of a dry red varietal like pinot noir, cabernet sauvignon or Syrah or a white wine like chardonnay or fume blanc will run you just 3 grams of carbs. A sweeter wine like Riesling has 4 grams in 4 ounces, while the same serving of muscat tallies 6 grams of carbs. A dry dessert wine will set you back 14 grams in 4 ounces, while a sweet dessert wine could cost you 16 grams. Champagne has 2 to 3 net carbs per ounce. If you want to indulge in a sweeter wine, consider sticking to a smaller serving. You have some other good choices if you’re out with friends or family and want to celebrate with an alcoholic beverage. Distilled liquors such as bourbon, gin, rum, vodka and scotch have zero net carbs in a 1-ounce shot. However, mixed drinks can blow your carb budget. Regular tonic water, for example, has 32 grams of carbs in 12 ounces, and cola delivers 35 grams. A 3.5-ounce serving of pina colada mix adds a whopping 22 grams of carbs to your drink. With mixed drinks, go for something like bloody Mary mix, with just 3 grams of carbs; a "lite" mix, with roughly 3 to 8 grams; or diet soda. Better yet, stick with plain water or club soda, neither of which has any carbs. Atkins: Can I Drink Alcohol Now That I Am in Phase Two? How Many Grams of Carbs per Day to Lose Weight?